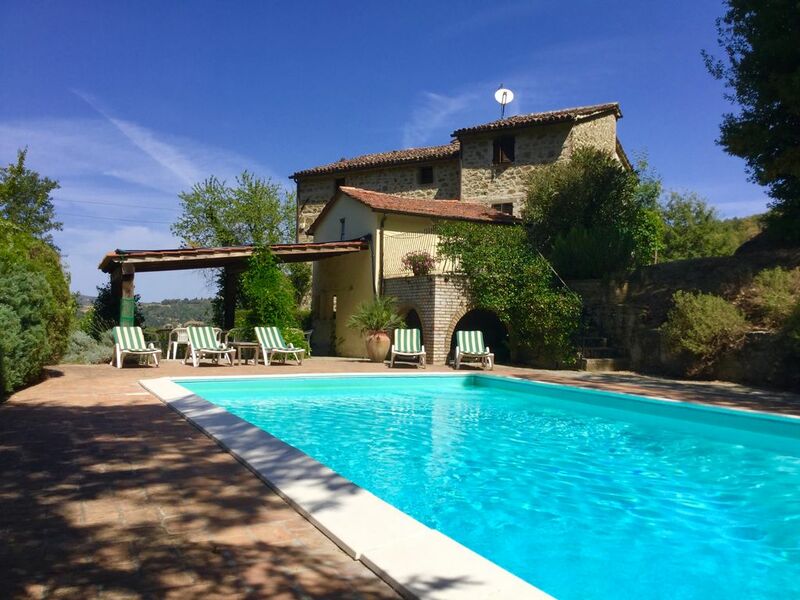 Ca de Luca is a 200 year old stone-built former farmhouse with private solar heated pool. The accommodation, arranged over 3 floors, sleeps 12 + 2 infants. It is situated 1.5kms up a white road in a clearing on a beautiful wooded hillside with uninterrupted views extending across to the other side of the valley. It is conveniently located for visiting all the key attractions in this beautiful part of Umbria and Tuscany. The location is peaceful with very little if any traffic noise. The property retains all its intrinsic character including terracotta floors and chestnut beamed ceilings. The house has been furnished as a home rather than a holiday rental and is child friendly with 2 travel cots, 2 highchairs and plates and cutlery suitable for children. Trestina is 15 mins away for all your food shopping and other practical requirements. The house has wi fi internet access for those of you who want to remain in touch. I fell in love with Italy many years ago when as a child I holidayed there often with my parents. As an 18 year old I went to live and work in Florence for 2 years and traveled throughout Tuscany and Umbria. My husband has a job which necessitates us moving house every couple of years, so we bought Ca de Luca to be our "home" and we return as often as we can. We have our own apartment within the house which we use during the winter months, which is not accessible for our guests. In the Summer we open up the rest of the villa for rent and for 3 weeks we invite friends and family to stay with us. Primarily we bought Ca de Luca as a house to call home and for us to be able to have all our friends and family to stay. We fell in love with the property straight away, despite seeing many houses and despite the fact it was very neglected. The garden had nearly overtaken the house, there was a colony of bats living in the house and it was filthy inside. Over a number of years, we made renovations and improvements and did a huge amount of DIY. This was a joy for us as the housing provided by my husband's job didn't allow for us to make any changes or make the house our own. Umbria is a beautiful region, not maybe the classic Italy that everyone thinks of, which is Tuscany, but it is less touristy even now 17 years after we bought the house and there are SO many beautiful villages and towns to visit close by or just enjoy the tranquil and peaceful setting and lounging by the pool. Ca de Luca is over 200 years old and has beautiful views across unspoiled countryside. It is easily accessible, being only 1.6 kms up a white road (as they're called in Italy i.e. an unsurfaced track). Many houses will be a long way from a road (which the owners won't tell you in their adverts! ), so it's easy to get to the local shops, restaurants or to travel further afield for sightseeing. 2 shower rooms, both with basin and wc. 1 large bathroom containing a bath and handheld shower, basin and wc. Large sitting room with comfortable sofas and a bench seat made using the original manger. There is a TV, video and DVD (including a selection of recent releases) and bookshelves containing English novels. There is both a 9 hole and 18 hole golf course about 40 minutes away (handicap card required). Notes on accommodation: The house is well-equipped for children, with 2 travel cots and 2 highchairs at no extra charge. The house is let on a self-catering basis. We provide a welcome back of basic foodstuffs for your arrival. We have 2 English caretakers who will come and see you the day after you have arrived to ensure that your stay goes smoothly. The double bedrooms all have 5' 3" metal framed beds. The linen is crisp, predominantly white cotton with light summer duvets for cooler nights. The twin beds are 3' wide and again all the linen is cotton. All the rooms are prettily but simply furnished and decorated. All the windows have built-in mosquito nets on them. There are room fans available for each bedroom. Pets - only by permission from the owners. Outside: Terrace with steps leading up to the pool house where sunloungers, cushions, pool toys, barbecue, WC and drying racks for wet clothes can be found. The swimming pool is 10m x 5m and has a saltwater chlorinator (very good for the skin!) The pool has a large paved surround with ample room for sunbathing, but with plenty of natural shade as well. At one end of the swimming pool is a large covered pergola with an enormous travertine marble table with seating for 16 people. It provides shade for long leisurely lunches, and has electric lighting, together with candles for warm evenings. The gardens, extend to approximately 3 acres, of terracing, trees, and shrubs. Cleaning / Towels / Linen / Maid service: The maids come once a week on changeover days to clean and change the linen, including swimming towels. Other: Dining room with a large table seating up to 12 and French doors leading onto the breakfast terrace complete with table and chairs. Entrance hall with guide books and maps for the area and French doors leading out onto the terrace. Idyllic setting. Very peaceful surroundings in a beautiful old house. 11 of us (6 adults and 5 children) spent a week at Ca de Luca. The house is well equipped and typical of the region.The countryside is beautiful and very peaceful. Many larger houses in Italy are separated in flats with a shared pool - Ca de Luca was one of the few I could find that would accommodate us in one space. Luly was very helpful with enquiries and left us a welcome basket of food and wine for our first night. Two members of our party were very young (3 and 23 months) so it was a bit hectic watching them on the steps and stair cases but there were 6 adults, so we managed well.All in all a perfect Italian countryside property. Thank you for your kind review and so pleased you had a lovely holiday. I would love to welcome you back another year! If you're the sort of person who demands flawless, contemporary, 5* hotel-like accommodation where you don't have to give a second thought to your water or electricity usage then this might not be the place for you. If, however, like us you want a charming villa, with bags of character, which really does have everything you need for a large family gathering in a very quiet rural location, then you won't be disappointed. The water supply is from the villa's own well, so in theory is limited. In practice, we were reasonably careful, and had no problems whatsoever. Likewise, as long as we didn't run the dishwasher, oven and washing machine all at the same time, the supposed electricity supply limitations were of no concern either. The house remained comfortably cool inside providing a welcome respite from the 36C temperatures outdoors. The pool is perfectly situated - there always seem to be some parts in the shade and others in the full sun at any time of day. We had a 6-month old with us, and had no problems keeping him comfortable despite the heat. The kitchen was small but well equipped. The chest freezer and separate beer/wine fridge got a lot of use! The location is very quiet - the last few hundred metres being along a steep, dusty gravel road. This just adds to the sense of isolation, although like us you may question whether you're on the right road on arrival! The weather was a little warm to do a lot of exploring of the area. However, we did make it to the hill top towns of Cortona, Gubbio and Monte Santa Maria Tiberina all of which we can thoroughly recommend. The countryside to the north looked particularly attractive. All in all, we thoroughly enjoyed ourselves and were very sad to leave Ca de Luca. We rarely go to the same place twice on holiday, as we enjoy exploring new places. However, in this case, we may well make an exception. Thank you for your kind review and I'm so pleased that Ca de Luca turned out to be exactly what you wanted for your large family gathering. I would love to welcome you back another year! Very charming house in a beautiful garden and location. Friendly owner and lokal caretaker. We had some lovely , lasy summer days by the pool and in the shadow from the pergola. The supermarket in Trestina was excellent. Sad to leave, would like to come back. Thank you for your kind review, would love to have you back to stay again, 2 weeks next time?! Super vakantie, ongestoord genieten in alle rust. Heel erg fijne vakantie gehad met een familie van 11. Ontzettend genoten van de rust, de stilte. De omgeving rond het huis is fantastisch. Wel redelijk afgelegen wat maakt dat je toch even moet rijden om bij een grote supermarkt te geraken. Beddenlinnen, handdoeken, handdoeken voor rond het zwembad waren allemaal aanwezig. Ook de kinderbedjes en stoelen waren aanwezig. De buitentafel voorziet meer dan genoeg plaats en regelmatig ook schaduw om te schuilen van de warme zon. De problemen met het internet werden zo snel mogelijk verholpen. Algemeen heel erg genoten van 10 dagen in san pietro a monte. Zeker een aanrader voor wie weg wil uit de toeristische drukte en wil genieten in de volle natuur. It is about 50 mins drive to the beach at Tuoro on Lake Trasimeno where you can windsurf, canoe, pedalo, kite surf (when conditions permit) take a ferry trip to the islands or just soak up the sun. Perugia - 40 mins, Ryanair from Stansted. Rome - 2.5 hours. Bologna - 2 hours - BA from Heathrow, Easyjet from Gatwick and Ryanair from Stansted. Ancona - 1.5 hours - Ryanair. All the major car hire firms are represented at the airports and it is essential to have a car. Detailed directions will be supplied together with a map when you rent this property. Distances by car for sightseeing, Citta di Castello, Monte Santa Maria Tiberini 15-20 mins, Monterchi, Anghiari, Sansepolcro 30 mins. Arezzo 45 mins. Gubbio, Perugia, Cortona 40 mins, Assisi, Lake Trasimeno 50 mins. Florence 1.5 - 2 hrs. The nearest town, Trestina, is 15 minutes by car and has several supermarkets, post office, baker, butchers, fishmonger (Fri), freshly prepared takeaway food, bars, chemist, internet cafe, clothes and toy shops and tennis court. Just a few minutes from the house in the next door village of Calzolaro, there is pony trekking available. There are several restaurants and pizzerias, 1 in particular is highly recommended with an extensive menu and wine list. Ca de Luca is an ideal base for sightseeing trips including Perugia and Assisi, Florence and Sienna. There are also many smaller hilltop towns in the area; Gubbio, Citta di Castello, Sansepolcro, Monterchi, Cortona and Montone among others. Booking Notes: Cot and highchair hire is free of charge, but please tell the owners if you require them. There is no breakage deposit, but we would ask that you notify the caretakers so it can be replaced if required. Changeover Day: Changeover day is Saturday. Guests are requested to arrive after 4.00pm and depart by 10.00am to allow time for cleaning and linen to be changed. Notes on prices: Prices are for the property per week in UK Pounds and are inclusive of cleaning, electricity, gas, linen, towels (bath and pool), 2 travel cots and 2 highchairs and basic food for Sat evening and Sun morning.